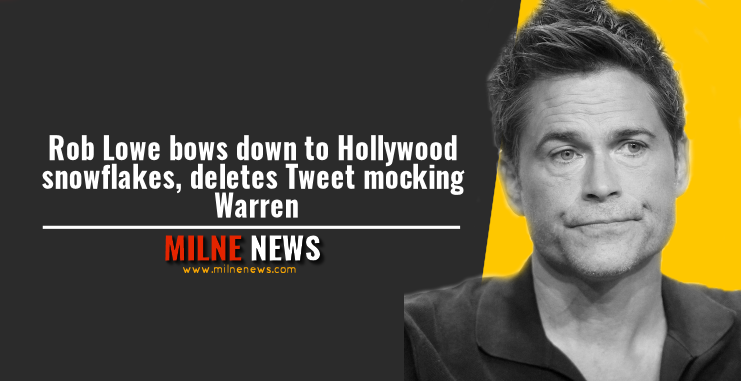 After the Hollywood morality police saw Rob Lowes tweet about Elizabeth Warren they demanded he delete it. So he shamefully bowed down and removed his post. Lowe’s response on Twitter came after Warren officially launched her 2020 presidential campaign with a kickoff event in Lawrence, Mass. “Elizabeth Warren would bring a whole new meaning to Commander in ‘Chief,’” Lowe wrote in the now-deleted post, a reference to the controversy over Warren’s claims of Native American heritage. This did not go down well with the Hollywood PC police. “Don’t. Jesus,” Valerie Bertinelli who Google says is from “Hot in Cleveland” also chimed in. After the attacks, Lowe decided it was best to remove the post.